Can our leaders bring peace to South Sudan? Recently the South Sudanese musician Agutmadul (Panchol Deng Ajang) came to Phoenix Arizona to perform. He was kind enough to give Ramciel an interview. RM: Thanks for taking the time to talk with us. PDA: And thank you for taking the time to interview me. RM: This is your first visit to America, what inspired you to come now? PDA: Well, I was invited. I think with all the chaos and bloodshed that is going on in our homeland, many of our people all over the world are thinking back to what was, to the SPLM and the idealism that existed when our country declared its independence. RM: And you are a major voice of that time and spirit. PDA: I hope so. It was my great honor to help give words and music to our struggle. RM: How did that happen? How did you happen to become the musical voice for the cause? PDA: First off, I was lucky to come from a musical family. Both my father and my brother were very successful singers. RM: So, during the war, you were already singing and performing for the cause? 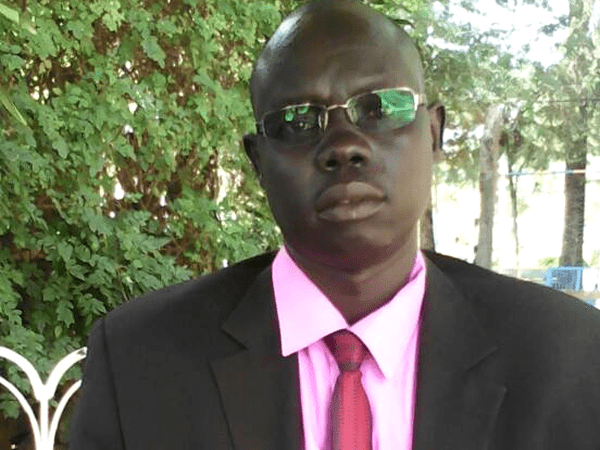 PDA: Not at first, I was a soldier when Majok Ayom discovered me. He heard me sing and took me under his wing. He was my mentor and friend. Even after the war was over, he helped me. He sent me to school in Kampala. Without an education, it would have been difficult for me to make the transition into the music world. RM: What a wonderful mentor he must have been. PDA: Yes, my family could not have helped me, so Majok was like a second parent to me. RM: How did he help get the SPLA to notice you? PDA: He didn’t. I had a second godparent, Makuei Ruei, who was an officer in John Garang’s headquarters. He collected all the moral songs from the movement on cassette and he heard some of my songs and loved them. Then he played them for the Chairman. Garang loved my songs. He said that I fought the war more than many of the people who carried guns. A few days later, I was invited to sing at a big show. I sang in front of John Garang. The Chairman wanted me to compose more songs. I filled three tapes with new songs. After that, I went back to be with Majok, but the headquarters kept asking for more songs. When the Chairman went to Khartoum to be sworn in as vice-president of Sudan, he wanted me to go with him. I was too far away and couldn’t go, so I stayed in Uganda. I wish I could have been there, but I couldn’t. RM: You performed it last night and the audience was very moved. PDA: Yes, it is important for us to remember the cause and of course John Garang was the embodiment of that cause. To this day, I think of him all the time and wish that he had survived. I think that our country would be in a much better place. RM: Many people feel that President Kirr has let our country down, but you recently wrote a song about that. 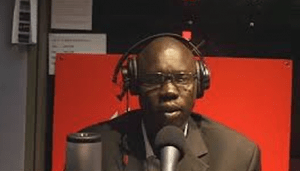 PDA: I composed “Bahr El Ghazal never left and Kiir never left.” You know, the president never stopped supporting the SPLM or John Garang. He may have made some mistakes, but in my opinion, we should be supporting him. I know there are people who disagree with me, but I think that we have to hold true to the SPLM and not lose our way as a country. RM: As well-known as you are for your political songs, you also write other things. One of my favorite songs is “Akuol Majok.” I was really happy that you sang it at the concert last night. PDA: I’m an excellent traditional Monjieng dancer and when you are a good dancer you’re inclined to look for a vital girl whom everyone might be looking for as well. Such an elegant, beautiful, and charming girl is always one’s desire to dance with, and I’m no exception. Each group of young men usually teamed up to the win the mind and attention of that enthrall girl and that girl symbolically resembled my aunty Akuol Majok. So on the dance floor, I found a girl which exemplify my aunt (Akuol Majok), and I danced with her. I danced with that beautiful stranger girl with an astonishing hip which she used for pacing me back and forth, and I caught up with her in a marathon dance like and until I was showered with sweat…. RM: I’m not a very good dancer, but I get a bit sweaty just listening to that song. PDA: (laughs) Yes, that is one of my songs that a lot of men like. 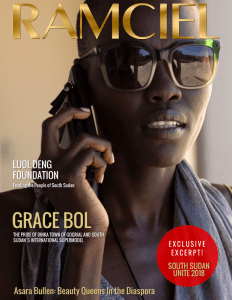 RM: Still, most of your songs are about politics and the struggle for a better South Sudan. PDA: And I will continue to sing those songs and to write new ones until our country has attained the future that John Ganag and other leaders saw for us. We did not live in the bush and suffer in the camps for nothing. There have been too many deaths and too much pain for those of us who struggled to walk away. That is why I will keep raising my voice. RM: Thank you for sharing your time with us today. PDA: You are welcome and Thank you.